What is MyConnect™ active ingredient? What is the difference between endo- and ecto-mycorrhizae? Are mycorrhizae compatible with all soil types and conditions? If my soil already contains mycorrhizae, will I benefit in adding more? When is the best time to apply mycorrhizae? Are mycorrhizae compatible with all types of plants? Do mycorrhizae need to be reintroduced on a regular basis? What is the best way to apply mycorrhizae? I’ve heard that chemical fertilizers can be bad for mycorrhizal establishment is that true? Are mycorrhizae compatible with chemical pesticides (fungicides, herbicides, insecticides)? Should I look for products with more than one species of mycorrhizae? Some companies advertise their mycorrhizae concentration in terms of spores VS propagules per gram (ounce); what is the difference? What is the minimum applied concentration of mycorrhizae I should aim for in my field? How long can mycorrhizae be kept in storage? I want to order my product before the season starts, what are the best storage conditions for mycorrhizae? Are mycorrhizae effective in all types of horticultural growth substrate? Why should I choose MyConnect© over competitive brands? MyConnect© world exclusive technology allows us to manufacture the most pure and performant mycorrhizae species. It offers the highest and most effective application rate of spores per plant (acre/hectare), which provides better performances than the average mycorrhizal products found in the industry. Thus, MyConnect© users gain access to better and consistent results through optimal concentrations of the most resistant mycorrhizal propagation units, all this while saving money. If you need to try one, why not the best? Learn why we advertise our concentration in spores and not in propagules. What are the benefits of mycorrhizae? I practice conventional agriculture / horticulture; why is it good to use MyConnect©? MyConnect© products offers a stunning return on investment. It allows you to increase your yields and productivity level, in a cost-effective way, while reducing your phosphate fertilizer needs by up to 30%. This is explained by the beneficial action of the application of MyConnect© seed inoculant, which connects to plant roots and develop a large network of root-like extensions (hyphae), allowing a maximized access to water and soil micro- and macro-nutrients like nitrates (N), phosphates (P), and potassium (K). Thus, by reducing your initial fertilizer input and applying our mycorrhizae, you will increase profitability, get bigger yields and prevent harmful phosphate leakage in fresh water sources. This beneficial interaction, transferable in crop rotations and to downstream users, is considered the foundation of soil health and fertility. The more you apply it, the better your crops will perform. I practice organic agriculture / horticulture; how can MyConnect© help me? MyConnect© products allow you to achieve up to 30% increase in yields when you already practice organic agriculture / horticulture. This additional productivity is due to the beneficial action of mycorrhizae which connect to plant roots and develop a large network of root-like extensions (hyphae), allowing a maximized access to water and soil micro- and macro-nutrients like nitrates (N), phosphates (P), and potassium (K). Further, mycorrhizae increase overall plant health and nutritional value. This beneficial interaction, transferable in crop rotations and to downstream users, is considered the foundation of soil health and fertility. The more you apply it, the better your crops will perform. What is MyConnect© active ingredient? MyConnect© contains the most pure, resistant and effective species of endo-mycorrhizae available in the market. Mycorrhizae are highly specialized natural connections formed between plants and beneficial soil-occurring microorganisms called the mycorrhizal fungi. The process occurs as the fungi connect to the root system and develop a massive underground network of filament-like extensions, enabling plants maximized access to soil nutrients and water. Once a mycorrhizal fungi propagule germinates, it connects with the plant roots and forms specialized exchange structures. It will then grow out in the surrounding soil to create an extensive network of filament-like extensions (reminiscent of a web). This network increases by 100-1000 fold the plant capacity to catch nutrients in the environment. Mycorrhizae will then drive nutrients, such as phosphate, nitrogen, potassium, microelements and water, to the plant in exchange for sugars. Not only does this relationship promotes bigger yields, plant health and nutrition, it also increases resistance to stresses. Mycorrhizae have also been shown to activate the beneficial soil microbial activity associated with plant roots (i.e. rhizosphere), increasing soil fertility and structure. Endo-mycorrhizae (the ones found in the MyConnect© product line) form connections with plants inside the root core, through specialized structures called arbuscules, where the nutrient exchanges take place. This type of mycorrhizae establish relationships with more than 85% of plant species worldwide, including most major commercial agricultural and horticultural cultures. Ecto-mycorrhizae, on the other hand, do not penetrate inside the core of the plant roots, but rather develop between the root cells and form a complex nutrient exchange interface called the Hartig net. They are mainly specific to woody plants, such as trees and shrubs, thus especially beneficial in the forestry and landscaping sectors. Although results may vary depending on soil types and conditions, inoculation with mycorrhizae are always beneficial when applied correctly and in sufficient amount. The optimal PH range is generally between 4 and 8. Mycorrhizae, especially species selected for the MyConnect© product line, have proven effectiveness in saline, acidic and alkaline soils, while improving plants tolerance to stresses like drought, salinity, heavy metals and petroleum contamination. This shows its resilience and tolerance to a broad range of conditions. The answer is yes. First, in most conventional agricultural field, the natural mycorrhizal fungi populations have been destroyed over time due to practices such as tilling, repeated pesticide applications and high dose of chemical fertilizer. The number left would pale in comparison to natural undisturbed environment. So reintroducing a solid population will greatly benefit your crops. Second, in organic soils, even if the population of mycorrhizae are generally healthier, the density is relatively low since they are spread over a large area. This distance delays the connection to the new plant roots. Knowing that the proximity of mycorrhizae propagules are critical to establish the mycorrhizal network, it is essential to inoculate early a high concentration when sowing, to take full advantage of the benefits mycorrhizae has to offer. Mycorrhizae are most effective when applied at early stages of plant development (e.g. on seeds, seedlings or plantlets) as it takes at least 4 to 6 weeks for mycorrhizae to establish a mature and extensive mycorrhizal network. 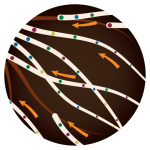 Once the initial connections are established, the mycorrhizal network made of filament-like extensions will capture and drive soil nutrients to the plant. This early application allows crops/plants to take full advantage of all the benefits mycorrhizae have to offer. The mycorrhiza species selected for the MyConnect© product line is compatible with more than 85% of plant species worldwide, including most major commercial agricultural and horticultural cultures. The only exceptions are plants in the family of Brassicaceae (e.g. canola, broccoli and cabbage), Poligonaceae (e.g. buckwheat, rhubarb) and Chenopodiaceae (e.g. quinoa, spinach and beets). However, the addition of mycorrhizae in such crops can still activate the beneficial soil microbial activity intimately associated with plant roots (i.e. rhizosphere) and generate better yields. Generally speaking, the more you apply, the better the results. Fortunately, once a plant has established the association with mycorrhizae, it is for the rest of its life. For frequently or completely harvested plants (agriculture, greenhouses), it is necessary to reintroduce mycorrhizae at each cycle. However, benefits are transferable during crop rotations in the same field, and a strong mycorrhizal population will build over time, increasing soil fertility, plant health and yields. This is particularly the case in organic regime and with no-till operations, where the mycorrhizal network is less disturbed. Mycorrhizae can be applied in many different ways which blend seamlessly in day to day operations. However, one basic principle should always be respected to ensure the best results: close proximity or physical contact to the plant roots or seeds. The reason is that when the mycorrhiza propagules germinate, they need to be in close vicinity to the roots to establish a contact and form the beneficial connection to further create the mycorrhizal network. For example, drench application in the field is not recommended as spores will be spread to the surface and not close enough to the seeds to establish early contact. In agriculture, aim for practices such as mixing with seeds or liquid application in furrow to obtain best results. Applying a full initial dose of chemical N-P-K can slowdown mycorrhizal process at initial stages of plant development. Mycorrhizae are known to be highly effective in capturing nutrients from soils, especially phosphate (P), so the initial dosage of P is of utmost importance for further benefits in plant growth. A mere reduction of 15% to 30% of the recommended initial phosphate dose would give enough time to the mycorrhizal network to develop, unleashing all its benefits. In addition to obtaining bigger yields, a phosphate reduction will generate big savings. In general yes, but it depends on the nature of the chemical used. Some generalist pesticides or systemic fungicides can be harmful to mycorrhizae. In general, we recommend to apply them separately and to avoid mixing pesticides and mycorrhizae together in the same tank. Drench fungicide applications should be done two weeks prior or four weeks after mycorrhizae inoculation. The more you wait to apply compatible fungicide after sowing, the better mycorrhizae will perform. Foliar sprays of fungicide (except systemic ones) have little or no effect on mycorrhizae performance. If you have any doubt or questions about pesticides application alongside mycorrhizae, or specific product compatibility inquiries, please contact us. Not really. The first crucial criteria to look for when searching for a suitable and effective mycorrhizae product is the spore concentration, the recommended application rate per acre, and… the price to do so! 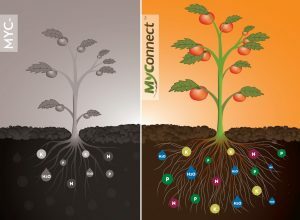 The species expertly selected for the MyConnect© product line, is dominant and native in agricultural fields worldwide, ultra-aggressive at establishing the connection with the plant roots and to create the mycorrhizal network, resulting in better short-term outcomes and long run performance. Also, keep in mind that having more than one species in a product can create compatibility issues if poorly chosen, as they will compete against each other rather than exclusively help the plant. Propagules are by definition any part of the mycorrhizal fungi than can germinate and effectively connect with the plant roots to establish the beneficial relationship. Propagules include intra- and extra-radical spores (which are resistant reproductive structures, reminiscent of small pearls), mycorrhizal root fragments and small filament-like structures called ‘hyphae’. The latter lose their effectiveness quickly as a propagation agent as they are brittle with little energy reserve. Always be on the lookout for products with high concentration of spores since they are much more resilient and effective propagules in the mycorrhizal inoculum. In addition, they pack high reserves of energy and can be stored for extended periods of time in the appropriate conditions. In general, a product offering at least 300,000 spores / acre of application rate is recommended to ensure benefits. At RISEHoP, thanks to our exclusive technology, we offer high return on investment with products harboring a minimum guaranteed application rate of 360,000 spores + 7,500,000 propagules per acre, which is miles away from the average concentration found in other similar products on the market (between 80,000 – 240,000 propagules/acre). Knowing that your crops can’t overdose from mycorrhizal inoculation, RISEHoP sets the standard for performance. (See answer about difference between spores VS propagules). Mycorrhizal fungi are living microorganisms with a finite amount of energy reserves to survive long storage periods without a host plant to germinate and establish a connection. After a certain time, even in the best conditions, the viability of the mycorrhizae propagules slowly starts to decline. At RISEHoP, we take into account the nature of the product and increased the spore’s concentration to guarantee the maximum effectiveness of the product for 2 years after the manufacturing date, when stored in the recommended conditions. We recommend storing mycorrhizae in a cool (between 4 – 25 °C (39-77°F)), dry environment, and avoid direct exposure to sunlight. Also, try to protect the product against extreme temperature variation prior to application (below the freezing point or above 35 °C (95 °F)). RISEHoP takes the utmost precautions and means to ensure the respect of these conditions during all manufacturing steps and transportation of the product. Yes. They have been shown to be effective in a wide range of soils (compost, gardening mix, etc. ), but also in soil-less substrates such as peat moss, coconut coir, wood chips, rock wool, perlite, vermiculite etc. They can also survive in completely aqueous environment.